Gameloft races back onto the iPhone with a follow-up to last year's arcadey Asphalt 4: Elite Racing. By tweaking and tuning the formula that made last year's entry such a rubber-burnin' blast, Asphalt 5, despite hitting one major bump in the road, positions itself as the platform's premier racer. Garage Full of Features: A gorgeous, full-featured title, Asphalt 5 nearly rivals even the best PSP racers. Three modes-quick race, career, local and online multi-player, 33 cars, 12 tracks, vehicle customization, and unlockable stat-boosting babes-yes, you heard right!-combine for a robust arcade racing experience. Additionally, three intuitive control schemes complement gameplay that blends Burnout's adrenaline-amping crashes and Ridge Racer's wind-in-your-hair thrills. Matching the content-brimming package is a pop-off-the-screen presentation encompassing colorful environments and great details such as planes flying overhead, day/night races, and changing weather conditions. Turn Up the Tunes: While racing to your own soundtrack is nothing new to the genre, it's damn cool to be able to lap the competition while your iPod library blasts in the background; the slick little Alpine stereo interface is also a very nice touch. My only regret is that I didn't have the Benny Hill Show theme loaded onto my play-list to accompany my more crash-tastic races. That said, listening to the Pixies' Surfer Rosa while hurtling towards the finish line at mach speed is super satisfying. The Short Arm of the Law: While most of Asphalt 5's career challenges — Time Trial, Drift, Duel, Escape etc. — yield a well-balanced blast, Cop Chase, where you play the boys in blue and "eliminate" opponents by crashing into them at top speed or forcing them off the track, is about as entertaining as a snipped brake line. The event gets easier-and is often skippable — later in your career, but the very first one tasks you with tackling seven eliminations in three laps. I reached "Where is my mind", the last track on the aforementioned Pixie's 30+ minute debut album, four times — yup, two hours — before reaching this frustrating goal. Any game, no matter how good it is otherwise, is docked a few points if its gameplay can actually make me dread hearing one of my favorite bands. Hopefully Gameloft will alleviate this headache in a future patch. Tons of content, fun-as-hell gameplay, great visuals, and the ability to rock your own tunes make this one the iPhone's top performer on the race circuit. That said, those who lack the patience to complete that very first, brutally difficult Cop Chase won't get to experience much of what the title offers. If you can get past that hurdle, though, this one's definitely worth buckling-up for. 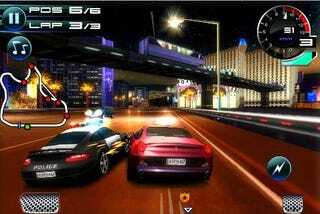 Asphalt 5 was developed and published by Gameloft for iPhone on November 2nd. Retails for $6.99. A copy of the game was provided by the publisher for reviewing purposes. Completed the game's campaign and played online modes.